On Oct. 5, 1914, at 6 a.m., a dapper little man with a long waxed moustache and wearing spats entered the Ridgefield Town Hall. Municipal elections back then were in October, and the town had just bought a modern replacement for the paper ballot system that been used for two centuries. It cost $600 — about $15,000 today. Frederic Fayerweather became the first person in Ridgefield to cast a ballot using voting machine. But that was hardly the Ridgefield native’s most notable achievement. 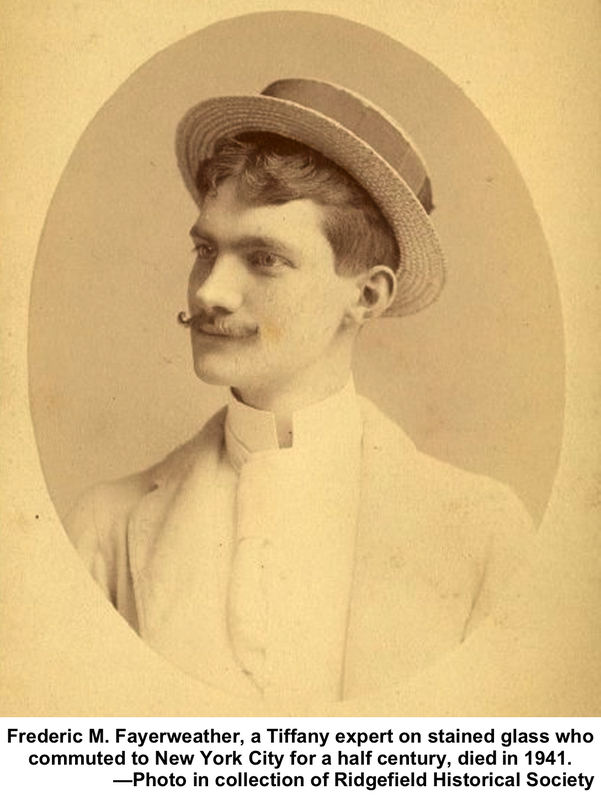 A bachelor and lifelong resident who commuted to the city, Fayerweather was one of the top talents at Tiffany Studios in New York. He oversaw projects throughout the country for Louis Comfort Tiffany and was an expert on the design and use of stained glass windows for churches. An unusual piece of Fayerweather-designed religious art is viewed by hundreds of Ridgefield church-goers each week. 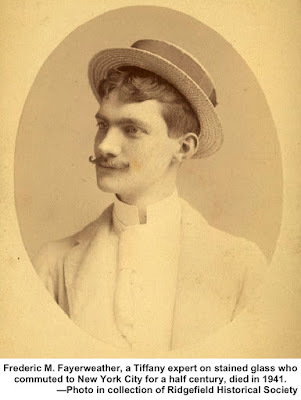 Frederic Moore Fayerweather was born in the Florida District of Ridgefield in 1860, the only child of John and Catherine Moore Fayerweather. His father, a teacher, played the organ at the Methodist Church in Georgetown — and, in fact, he helped the Georgetown Methodists acquire the organ, making it one of the few churches in the area at the time with a musical instrument. He attended the old red-brick Florida Schoolhouse and in his late teens became a teacher, instructing classes at the Ridgebury and Limestone Schools. By his early 20s he was working in New York City and at 22, joined Tiffany Studios, which specialized in art decorations, especially stained glass windows. He became head of the monumental department, and was considered an expert in color harmony and in the design of stained-glass windows. Fayerweather worked for Tiffany for more than 40 years. For all that time, he made his home in Ridgefield and commuted by rail — from the 1880s until his retirement in 1931. 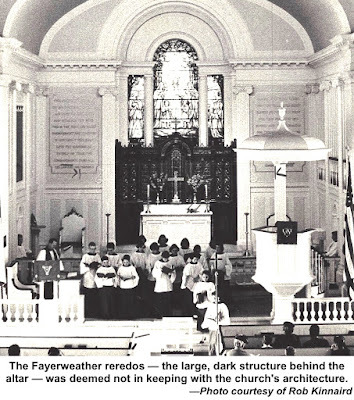 Like his father Fayerweather was deeply interested in religion and especially its rituals. Unlike his Methodist father, Frederic was an Episcopalian and, in fact, a pillar of St. Stephen’s Church where he was a vestryman for many years. He sang tenor in the choir, then became the choirmaster and choir director. One of his last duties was to arrange the music for the church service that occurred just before his death. When he died in 1941 at the age of 80, he left most of his estate to St. Stephen’s, including creating a fund to pay the salaries of a quartet of men and women singers. He also wanted the church to spend at least $1,200 annually for an organist — that’s about $20,000 in today’s money. Rob Kinnaird, a historian of St. Stephen’s, reports that the Rev. Aaron Manderbach, rector of the church, had an expert in Episcopal church architecture look at the reredos. He found it not in keeping with St. Stephen’s Georgian style. That, “along with the church’s program to move the altar forward so the celebrant faced the worshipers, contributed to the eventual dismantling of the reredos,” Kinnaird said. The Congregationalists apparently also found the Fayerweather reredos too elaborate and perhaps overpowering and it reportedly found a new home in a church in another community.